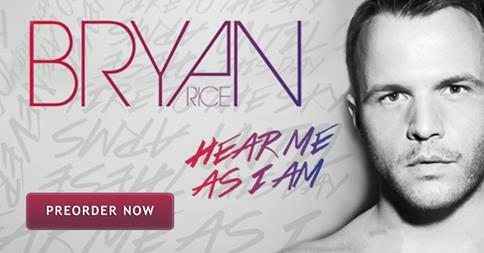 Preorder 'Hear Me As I Am' Album now! - and now you can preorder it and get a special present from Bryan! 'Hear Me As I Am', Bryans 5th album in 10 years, is released February 23rd, but from today you can preorder it on iTunes and iMusic.dk for physical copies signed by Bryan himself. If you preorder it on iTunes today, Bryan has decided to give you a present. Not only do you get the singles that are already released, Waiting For Love, I Choose U, Stay Awake and the latest single Hear Me As I Am, but you also get one of the new tracks from the album right away. About IOU Bryan says: 'It's a very special song written for all the people that supported me through the years. I have always felt that it is very important for me to say thanks, because if it wasn't for that support, for all the listening, downloading, going to concerts and writing kind messages, it would probably not be doing music. The song goes 'Is this real life, did we really get this far? Somehow we made it through a storm and ended up upon a star...' and that is how I feel releasing this album. Further it goes 'IO, IO, IOU, time to say it loud and sing it out, I know I owe it all to you' and that is my way to say 'thank you'. Click the red button to get to the page where you can choose either Download preorder from iTunes or physical signed copy from iMusic.dk. Preordering is essential to Bryan, as it releases a lot of sold copies on the release date to make the album top the charts. Copyright © *|2015|* *|ArtPeople&BRec|*, All rights reserved.